The Miike Snow project always seemed a tad curious to me. Two well-credentialed producers link up with a vocalist and crank out a startlingly well-crafted debut, with the hit ‘Animal’ still being a big favorite (though I myself found ‘Burial’ and ‘A Horse Is Not A Home’ to be Miike Snow‘s greatest tracks). Simple enough in principle, but does it work more than once? Big drums, that persisting rat-a-tat percussion as well, combined with bass-y, buzzing effects and grand, echoing vocals make for an easy hit early on the tracklist. On its own, a great song, but as a setup for the pre-release single ‘Devil’s Work’, even better! The two songs are a powerful pair that complement each other well. We should also touch on the more whimsical side of the record. Songs like ‘Enter the Jokers Lair’, ‘Vase’, and ‘Archipelago’ have a really free-flowing, almost lazy playfulness that struck me as a pretty unique sound. None of those tracks are my favorite (full disclosure: I skip ‘Jokers Lair’ nearly every time), but to their credit the set a really interesting tone, and serve as a necessary counterbalance to some of the faster songs. My other favorite song is ‘Bavarian #1 (Say You Will)‘. It has the same marching drum beat as ‘The Wave’, but steadily new elements are woven in with nearly each stanza of lyrics, building to a pretty cool sound. Awesome change-up (bridge? I don’t know squat about real music terms…) too, around 2:31. ‘Black Tin Box’ is a way more experimental, dark track compared to its peers, aided by the spooky vocals of Lykke Li. It bubbles beneath the surface for most of the five minutes, only occasionally breaking the surface for a breath of air. I liked that it wasn’t the closing track though, as he keyboard-driven dancy ‘Paddling Out’ is a much better send off. Like their debut, I do not unconditionally love every single song on Happy To You, but a handful are really spectacular, and rest are listenable and catchy at the very least. Also: Jackalope. Case closed! 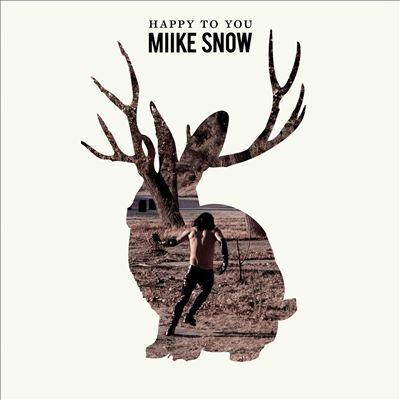 I love these two tracks…Miike Snow is such a mysterious group. Andrew Wyatt’s voice is amazing and the producers make the most incredible beats. Great choices for the post. Thanks for the thought, frustrated. I’m glad you enjoyed the tracks!